I’m not sanguine about our ability to solve the climate crisis — and it’s not because the monolithic forces of global capitalism won’t let us (although they’re not helping). It’s not because we’re too greedy and acquisitive (although we are). It’s not because things have progressed too far already for us to stop them (although they have). It’s because we humans aren’t very good at thinking in different timescales. We’re basically monkeys, and we have monkey minds. Our species-wide ADD started out as a feature, but in our present situation, it’s a bug. The words are frightening: fix atmospheric CO2, or in a century rising seas will wipe out coastal cities all over the world. Deal with methane release, or in a couple of hundred years the planet will be Venusized. If we completely stop adding carbon to the atmosphere, it will take the planet several thousand years to recover. No. A couple of centuries is a big time span for someone who believes in Young Earth Creationism (YEC), who accepts the chronology of Bishop Ussher. According to Ussher, the earth began in 4004 BC; it’s all a little over six thousand years old. A couple of centuries is a thirtieth of that total time. A thirtieth of a biblical human lifespan is a little over two years. Our political and economic systems are derived from the thinking of people who probably believed (whether they accepted Christian theology or not) that the earth was only five or six thousand years old. The Founding Fathers couldn’t think in the framework of Deep Time, because scientific Deep Time was just being discovered. Many aspects of our shared cultural narrative are still embedded in a YEC timescale — a timescale in which a couple of centuries is a thirtieth of the total age of things. You don’t have to be a Christian Fundamentalist to accept a YEC timescale; many of us do so unconsciously every day. And, of course, the corollary to the End of Time is the soteriological notion that humans who believe the appropriate things will get to spend eternity somewhere nice — while the Earth, a vessel of sin, will be destroyed. Needless to say, enacting this narrative leads to some pretty awful results for the environment and the planet, but hey! no biggie — if the Earth is only six thousand years old, it doesn’t have any great temporal mass, so destroying it is more like throwing away a piece of trash. According to Hindu mythology and Vedic cosmology the universe is cyclically created and destroyed. The life span of Lord Brahma, the creator, is 100 ‘Brahma-Years’. One day in the life of Brahma is called a Kalpa or 4.32 billion years. Every Kalpa (one day in the life of Brahma), Brahma creates 14 Manus one after the other, who in turn manifest and regulate this world. Thus, there are fourteen generations of Manu in each Kalpa (one day of Brahma). Each Manu’s life (Manvantara) consists of 71 Chaturyugas (quartets of Yugas or eras). Each Chaturyuga is composed of four eras or Yugas: Satya, Treta, Dwapara and Kali. The span of the Satya Yuga is 1,728,000 human years, Treta Yuga is 1,296,000 human years long, the Dwapara Yuga 864,000 human years and the Kali Yuga 432,000 human years. When Manu perishes at the end of his life, Brahma creates the next Manu and the cycle continues until all fourteen Manus and the Universe perish by the end of Bramha’s day. When ‘night’ falls, Brahma goes to sleep for a period of 4.32 billion years, which is a period of time equal one day (of Brahma) and the lives of fourteen Manus. The next ‘morning’, Brahma creates fourteen additional Manus in sequence just as he has done on the previous ‘day’. The cycle goes on for 100 ‘divine years’ at the end of which Brahma perishes and is regenerated. Brahma’s entire life equals 311 trillion, 40 billion years. Once Bramha dies there is an equal period of unmanifestation for 311 trillion, 40 billion years, until the next Bramha is created. Our fate as a species hinges on overcoming our inability to switch timescales as needed. If we can’t learn to think in a Deep Time framework, we’re doomed. It’s as simple as that. Mayflies have survived mostly unchanged for 350 million years according to scientists. So they were around before dinosaurs even existed! A US Senator serves a term of 2,190 mayflies before coming up for re-election. A US Representative, on the other hand, only serves 730 mayflies. The president serves 1460 mayflies. The average “lifespan” of a non-recommended post on Daily Kos is about two hours; less during heavily trafficked periods, more in the middle of the night or on slow news days. The average lifespan of a recommended post is anywhere from four to twenty-four hours; let’s call it eight hours, or one-third of a mayfly. Let’s make the average post a new unit of time, and call it an AKP (Average Kos Post), or one twelfth of a mayfly. The AKP is a (very flimsy) measure of the attentional capacity of the political internet. A Senator serves 26,280 AKPs before coming up for re-election. If we don’t do something about methane release, we may become extinct as a species in 876,000 AKPs. Is it easier to understand why it’s sometimes so hard to get substantive discussion of climate matters on the part of the internet that’s focused on politics? If we take robust measures to limit CO2 emissions, it might take 11,000 mayflies before the rate at which things are getting worse can be expected even to start slowing down a bit. It could be 110,000 mayflies before things start to get better. Remember that a US Senator only lasts 2,190 mayflies between elections. Is it easier to understand why it’s so hard to get our congresscritters to take climate change seriously? I found that paragraph in Stewart Brand’s book, “The Clock of the Long Now.” Let me highly recommend it to you; it can be purchased at the online store of the Long Now Foundation. is a proposed mechanical clock designed to keep time for 10,000 years. The project to build it is part of the Long Now Foundation. We can examine the array layer by layer, working down from fast and attention-getting to slow and powerful. Note that as people get older, their interests tend to migrate to the slower parts of the continuum. Culture is invisible to adolescents but a matter of great concern to elders. Adolexcents are obsessed by fashion, elders bored by it. The job of fashion and art is to be froth: quick, irrelevant, engaging, self-preoccupied, and cruel. Try this! No, no, try this! Culture is cut free to experiment as creatively and irresponsibly as society can bear. From all this variety comes driving energy for commerce…and the occasional good idea or practice that sifts down to improve deeper levels, such as governance becoming responsive to opinion polls, or culture gradually accepting multiculturalism as structure instead of grist for entertainment. If commerce is completely unfettered and unsupported by watchful governance and culture, it easily becomes crime…Likewise, commerce may instruct but must not control the levels below it, because commerce alone is too shortsighted. Infrastructure, essential as it is, cannot be justified in strictly commercial terms. The payback period for such things as transportation and communication systems is too long for standard investment, so you get government-guaranteed instruments such as bonds or government-guaranteed monopolies. Governance and culture must be willing to take on the huge costs and prolonged disruptions of constructing sewer systems, roads, and communication systems, all the while bearing in mind the health of even slower “natural” infrastructure, such as water, climate and so on. Education is intellectual infrastructure; so is science. Very high yield, but delayed payback. 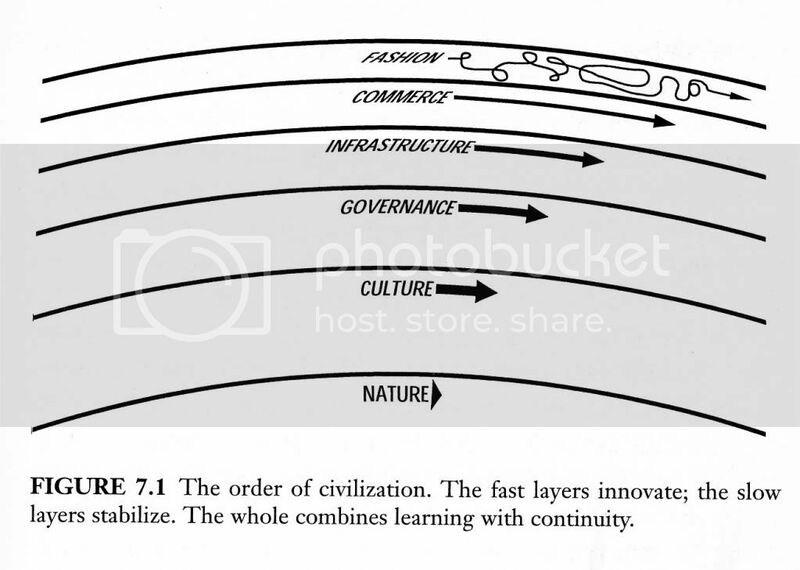 Culture is where the Long Now operates. Culture’s vast slow-motion dance keeps century and millennium time. Slower than political and economic history, it moves at the pace of language and religion. Culture is the work of whole peoples. As for nature, its vast power, inexorable and implacable, continues to surprise us….When we disturb nature at its own scale, as with our “extinction engine” and greenhouse gases of recent times — we risk triggering apocalyptic forces. Like it or not, we now have to comprehend and engage the still Longer Now of nature. The division of powers among the layers of civilization allows us to relax about a few of our worries. We should not deplore rapidly changing technology and business while government controls, cultural mores, and so-called wisdom change slowly; that’s their job….The total effect of the pace layers is that they provide many-leveled corrective, stabilizing negative feedback throughout the system. It is precisely in the apparent contradictions of pace that civilization finds its surest health. When “Clock” came out I bought about ten copies and gave them away; it is one of the books that has been most influential on my thinking and teaching. I cannot recommend it highly enough, and I strongly encourage you to find out more about the work of the Long Now Foundation. 1. A huge colony of the sea grass Posidonia oceanica in the Mediterranean Sea could be up to 100,000 years old. 2. Pando. This clonal colony of Populus tremuloides has been estimated at 80,000 years old, although some claims place it as being as old as one million years. 3. King’s Lomatia in Tasmania: The sole surviving clonal colony of this species is estimated to be at least 43,600 years old. 4. A huckleberry bush in Pennsylvania is thought to be as old as 13,000 years of age. 5. Eucalyptus recurva clones in Australia are claimed to be 13,000 years old. 6. Quercus palmeri: a clonal oak shrub near Riverside in California, isolated for centuries from the rest of its species, is dated at around 13,000 years old. Two-hundred and fifty million year-old bacteria, Bacillus permians, were revived from stasis after being found in sodium chloride crystals in a cavern in New Mexico. Russell Vreeland, and colleagues from West Chester University in Pennsylvania, reported on October 18, 2000 that they had revived the halobacteria after bathing it with a nutrient solution. Having survived for 250 million years, it is the oldest living thing ever recorded. 6. Temporal Equivalency: Comparison Across Timescales. The biblical three score and ten years of a human life, in days: 25,568. In hours: 613,632. In minutes: 36,817,920. In seconds: 2,209,075,200. In other words, a human being lives about 26,000 mayflies. A mayfly on your seventieth birthday is 26,000 lifespans distant from a mayfly on the day you were born. What were humans doing 26,000 lifespans ago? 26,000 “three-score and ten” human lives equals 1,820,000 years. An attosecond is an SI unit of time equal to 10−18 of a second. (one quintillionth of a second). In ratio, one attosecond is to one second what one second is to the age of the universe. 6. Two Pieces of Art That Will Change The Way You Think About Time. [it] is a musical piece composed by John Cage and is the subject of one of the longest-lasting musical performances yet undertaken. The current organ performance of the piece at St. Burchardi church in Halberstadt, Germany, began in 2001 and is scheduled to have a duration of 639 years, ending in 2640. Recording from friday 4th july, the day before the tone change on Saturday, 5th july 2008. The tone change (July 5, 2008). You can hear the piece online at the Halberstadt Event website. The chords don’t change terribly often, but I find it beautiful, both because I enjoy sustained sounds and because the notion of a musical piece lasting over six centuries strikes me as inherently optimistic. Think of how many layers of civilizational support are assumed in this performance! 7. Respect for old things. I have a piece of wood on my desk. It’s smooth and brown, and because it’s been carefully sanded and oiled, it reflects the light with a beautiful opalescence. It’s from the Kauri tree, a species native to New Zealand…and it’s fifty thousand years old. I’m an avocational woodworker, and when I saw in the back pages of Fine Woodworking magazine that Kauri logs were being pulled out of the earth and turned into lumber, I had to have a piece. The importer sold me a few offcuts for $75, and I polished a small piece into something that fits my hand. I like to hold it sometimes while I’m teaching singing; it makes me slower, more thoughtful, more careful. I’ve used some other bits for art projects, including an inlay on my fireplace mantel and a sculpture of nesting birds I made for my wife a few Christmases ago. In New Zealand there’s a guy who makes guitars out of Kauri. Previously, the oldest piece of wood I owned was a chunk of bog oak from the peat bogs of England, a blackened and gnarled thing, five thousand years old, that I was told was once part of the forests of Avalon. When I work with Kauri, I change my pace, and I change my tools. You can’t take a piece of wood that’s fifty thousand years old and feed it through a power planer; that’s just plain wrong. I will occasionally use the bandsaw, because it makes a very narrow cut — but mostly I’ll use hand tools, and I’ll make arrangements to collect the sawdust. I have a little jar in my shop, labeled “Kauri dust” and filled with tiny particles of the oldest wood in the world. When paleontologists unearth dinosaur remains, they proceed very carefully; fossils have enormous temporal mass, and need to be treated with respect. I’ll say that again. Fossils have enormous temporal mass, and need to be treated with respect. Around six million human lifespans ago (152,285,714,360 mayflies, if you want to be exact), the Carboniferous Period began on Earth. It lasted for around a million human lifespans (26,000,000,000,000 mayflies). The atmospheric CO2 content was very high, and it was very hot. Plants grew prolifically, eventually making a layer of rotting and dead vegetable matter thousands of feet deep in places. A little more than four million human lifespans ago, a massive disaster irrevocably changed the planetary environment…causing that layer of rotted vegetation to sink underground – together with a million human lifespans’ worth of sunlight energy locked in carbon. Which we discovered not very long ago and then proceeded to dig up and burn at an incredibly rapid rate. What we didn’t burn, we processed chemically, making stuff to protect ourselves, to feed ourselves, to amuse ourselves, to make ourselves feel better for a few moments. What we didn’t burn or process, we spilled and wasted. When we make plastic from petroleum derivatives, we are mistreating a piece of deep time; as a colleague said to me the other day, “we’re burning dinosaurs for fun.” Taking Carboniferous sunlight and turning it into a plastic bottlecap that winds up choking a baby albatross to death in the Pacific is a grotesque distortion of the dignity and beauty inherent in four hundred million years of temporal mass. Taking liquified Carboniferous sunlight and spilling it all over a wildlife refuge is a crime and an obscenity. In the spirit of Bill Maher, I’d like to propose a new rule: the greater the temporal mass of our energy source, the more important it is that we use it to make or do something lasting, beautiful, and beneficial. Let’s use petroleum to build a renewable energy infrastructure — not to blow leaves onto our neighbor’s front yards. Let’s use coal to hold up the mountains of West Virginia — not to power our Christmas lights. On the other hand, if we need energy because we desire fashionable iWants — let’s get it from renewables…or learn how to desire something else. 8. This Is The End Of My Post On Timescales. When you contemplate a purchase, think about how many layers of civilization are engaged. Think about how much temporal mass is involved in the product, in its packaging, in its projected span of use. Try not to burn dinosaurs for fun. If you have suggestions for helping people understand the relationships of timescale that give resonance and force to our planet, our species, our culture, our tribes…please share them in the comments. wauw just fantastic info,i like it ,Came across it via twitter!! Never thought there was so much about surviving as a species!!! Thank you for your comment. Can you pass a Turing test? Hey! This post could not be written any better! Reading this post reminds me of my old room mate! He always kept chatting about this. I will forward this article to him. Fairly certain he will have a good read. Thanks for sharing! Good review! Thanks for sharing! What an overview. Thanks for all the efforts you put into this. Very nice and deep stuff! I hope we can figure thisone out in time. The climate appears to be fragile, yet it also shows it’s highly adaptable. Still, I think the huge amount of people can give rise to some serious problems like diseases, epidemics etc. Let’s hope we solve it! Awesome. Thanks for sharing. I like it! Super stuff this!! Tnkks mate! Nice work! It was a pleasure to read. Came across it via twitter! Never thought there was so much about surviving as a species! so when you get to the end, the “let’s do…” part, we’re back at the beginning of the loop. namely, how do you convince, entice, coerce, educate, etc. people to gain insights that require them to slow down and think longer term? perhaps that area is the one most desperate for attention. That is an important distinction, I agree. And not all soteriological theologies adhere to end-of-the-world notions, of course. But I tend to think that the notion of individual or collective salvation of a post-mortem identity will lead generally to behavior and thinking that is less oriented to the maintenance of our Earthly home — since one’s “eternal home” is elsewhere. Salvationism is bad for the planet. Daniel Quinn discusses this in The Story of B. What a wonderful, thoughtful overview – it deserves a large audience. I wonder when the gear in concrete will run out of mechanical slack? This is a fantastic overview of the difficulties of long-term species survival; thanks for sharing. Running Gamak: Warren Senders' Blog is powered by WordPress.